These delicious salmon and goat cheese tartlets (tartelettes au saumon et chèvre) are a variation on our classic smoked salmon quiche recipe. We bake this simple quiche recipe when we fell like enjoying a warm and earthy quiche but either don’t have smoked salmon handy or ran out of creme fraiche. And serving a quiche in individual portions has a couple of advantages too. Consider this: first, it gives a nice touch to any weekday meal but very importantly, it is also great for portion control — a key part of the French diet (not always easy to stop at one slice of quiche, isn’t it?). This simple quiche recipe is perfect when you are in a hurry and are looking for dinner inspiration. Most of the ingredients can be stocked up ahead of time in the pantry, fridge and freezer so you can swing a fabulous dinner quickly and without any last minute run to the store. Serve it with a side salad and voilà, dinner is ready! So check below for the Art of the home detailed salmon and goat cheese tartlet recipe and Art of the Home suggestions, including a menu idea. Our simple quiche recipe can be assembled in a few minutes and is ready to eat in about 40 minutes. For reference, we also added any cookware or utensils used. When available at the boutique, we list the category under which they can be found so you can quickly drop by to take a look for the latest deal. Enjoy and bon appétit! Butter 4 individual quiche baking pans (or line bottom with parchment paper). Cut out 4 circles out of a thawed puff pastry. We use a breakfast bowl to cut out the pastry dough (one without the handles of course!) but you can use whatever you have in hands to cut out the circles. You can also simply use the quiche pan itself to cut out the bottom, then add a strip of dough for the sides, re-attach bottom and sides by pressing the edges together with your fingers – and voilà! Drain the salmon and in a small mixing bowl, break apart salmon with a fork. Cut two thick slices out of a goat cheese log (about 2 Tbsp), add a couple turns of pepper mills, heavy cream, and mix in with salmon. Note: canned salmon is already salted enough so we don’t add salt but you can certainly add 1-2 pinches if you’d like. 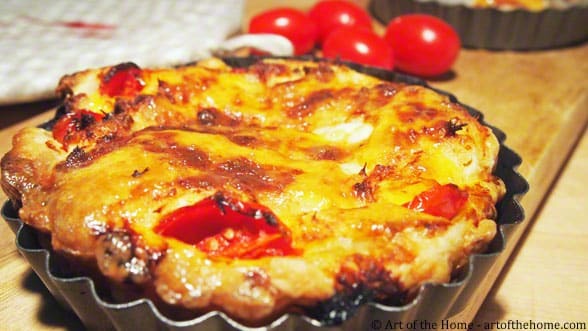 Prick dough with fork and spread mustard on the bottom part of the quiche crust. Scoop evenly the salmon/goat cheese mixture on top of the mustard. Slice the cherry tomatoes in half and place 4 halves on top of each tartlet. Beat eggs and pour evenly between your 4 quiche pans. Remove quiche from quiche pans by conveniently pushing up the bottom and slide directly on dinner plates. Salmon substitution: you can use a can of tuna instead of the salmon. Pie crust substitution: this recipe is also very good using pâte brisée instead of puff pastry — less fluffy of course but still so good. Menu suggestion: to enjoy an easy 3-course meal, you could start with a vegetable soup (which can be prepared ahead) and offer a yogurt for dessert.